In this Artifact Art piece, a cowboy, his horse, and his dog sit and ponder atop a grassy hill. The piece is painted on an old saw and mounted on a rustic board with sawtooth hangar for easy display on a wall. A horseshoe of historical significance (see Artist Note below) is also mounted on the handle to give the piece added authenticity. 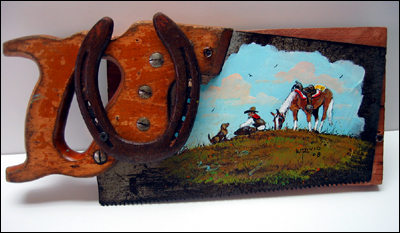 I cut this saw down in size to make it more compact as a painting. It is an Original acrylic and has five hidden images throughout the painting. The horseshoe mounted on the handle came from the former John Wayne Red River Ranch in Stanfield, Arizona.